﻿José Xavier with Hanne Nielsen (president of APECS international, University of Tasmania, Australia; on the left) and Gerlis Fugmann (executive director of the APECS international/ Alfred Wegener Institute, Helmholtz Center for Polar and Marine Research, Germany (on the right). José Xavier, professor at the Department of Life Sciences of the Faculty of Sciences and Technology of the University of Coimbra (FCTUC) and researcher at the Centre for Marine and Environmental Sciences (MARE) won the international prize “APECS International Mentorship Award 2018”. 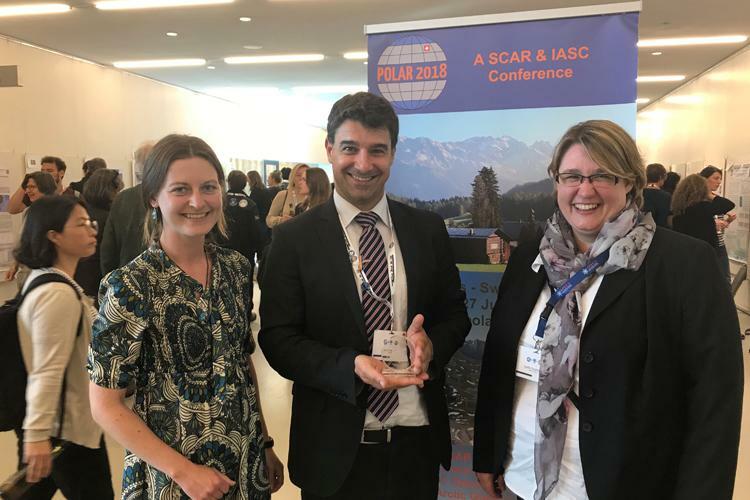 Created by the Association of Polar Early Career Scientists (APECS), with members from more than 60 countries across the globe, the prize aims at distinguishing the efforts of the scientists, within the polar scientific community, who invested time and energy supporting the young polar scientists. All national committees of APECS participate in the winner election process and appoint the mentor scientist who have made exceptional contributions for the success of the Association.